Bambusa multiplex (Lour.) Raeusch. ex Schult.f. This species is accepted, and its native range is Nepal to Taiwan. Cultivada en Colombia; Alt. 800 - 1500 m.; Andes, Valle del Cauca. Perennial; caespitose. 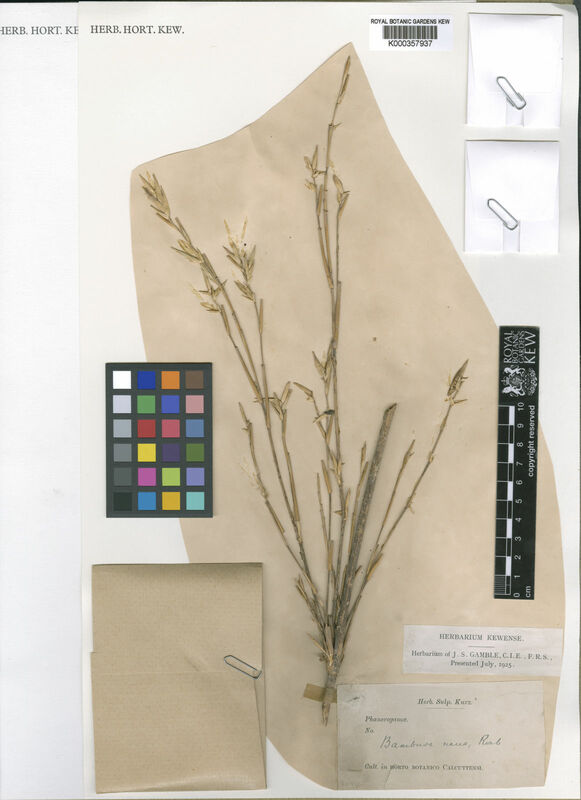 Rhizomes short; pachymorph. Culms erect; 200-400 cm long; 10-30 mm diam. ; woody; without nodal roots. Culm-internodes terete; thin-walled; mid-green; distally glabrous. Lateral branches dendroid. Bud complement 1. Branch complement three, or several; in a clump; with 1 branch dominant; thinner than stem. Culm-sheaths deciduous; auriculate; ciliate on shoulders. Culm-sheath ligule 1-1.5 mm high. Culm-sheath blade triangular; 1-2 cm long; acute. Leaves 7-13 per branch. Leaf-sheath oral hairs setose; 3-5 mm long. Leaf-sheath auricles falcate. Ligule an eciliate membrane. Collar with external ligule. Leaf-blade base with a brief petiole-like connection to sheath; petiole 0.1-0.2 cm long. Leaf-blades deciduous at the ligule; lanceolate; 7-10 cm long; 10-13 mm wide; dark green and glaucous; discolorous with last colour beneath. Leaf-blade surface puberulous; hairy abaxially. Leaf-blade apex acuminate. 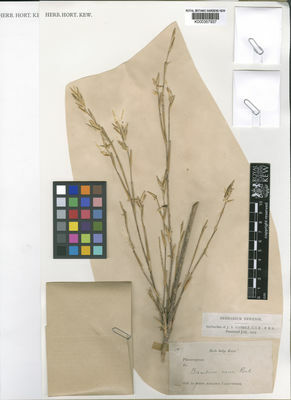 Synflorescence bractiferous; clustered at the nodes; in untidy tufts; lax; with spathaceous subtending bracts; with axillary buds at base of spikelet; prophyllate below lateral spikelets; leafless between clusters. Spikelets comprising 7-10 fertile florets; with diminished florets at the apex. Spikelets lanceolate; laterally compressed; 30-40 mm long; breaking up at maturity; disarticulating below each fertile floret. Rhachilla internodes definite. Fertile lemma lanceolate; 15 mm long; without keel; 20 -veined. Lemma apex acute. Palea oblong; 1 length of lemma. Palea keels winged; ciliate. Apical sterile florets resembling fertile though underdeveloped. Lodicules 3; membranous. Anthers 6; 6 mm long. Stigmas 3. Ovary umbonate; pubescent on apex. Africa: western Indian ocean. Asia-temperate: Caucasus, western Asia, China, and eastern Asia. Asia-tropical: India, Indo-China, Malesia, and Papuasia. Australasia: New Zealand. Pacific: southwestern, south-central, northwestern, and north-central. South America: northern South America. Bangladesh, Bismarck Archipelago, Brazil Southeast, Cambodia, Colombia, Cuba, Dominican Republic, Ecuador, Florida, Haiti, Iraq, Jamaica, Lesser Sunda Is., Madagascar, Malaya, Mauritius, Mexico Southeast, Nansei-shoto, New Zealand North, Pakistan, Puerto Rico, Seychelles, Sri Lanka, Sulawesi, Trinidad-Tobago, Windward Is. Bambusa argentea var. vittata Nehrl. Bambusa glaucescens f. albostriata Muroi & Sugim. Bambusa glaucescens f. albovariegata (Makino) Muroi & Sugim. Bambusa glaucescens f. alphonso-karrii (Mitford ex Satow) Hatus. Bambusa glaucescens f. elegans (Koidz.) Muroi & Sugim. Bambusa glaucescens var. floribunda (Buse) Hatus. Bambusa glaucescens f. fu-komachi Muroi & Sugim. Bambusa glaucescens f. midori Muroi & Sugim. Bambusa glaucescens f. solida (Muroi & Maruy.) Muroi & Sugim. Bambusa glaucescens f. variegata (E.G.Camus) Muroi & Sugim. Bambusa glaucescens f. viridistriata (Makino ex I.Tsuboi) Muroi & Sugim. Bambusa nana var. alphonse-karrii (Mitford ex Satow) Kawam. Girmansyah, D. & al. (eds.) (2013). Flora of Bali an annotated checklist: 1-158. 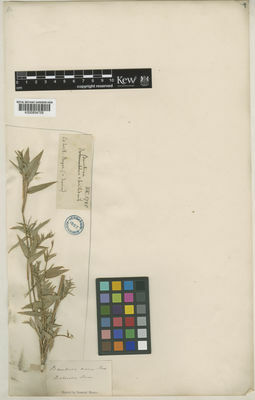 Herbarium Bogorensis, Indonesia. Flora of North America Editorial Committee (2007). 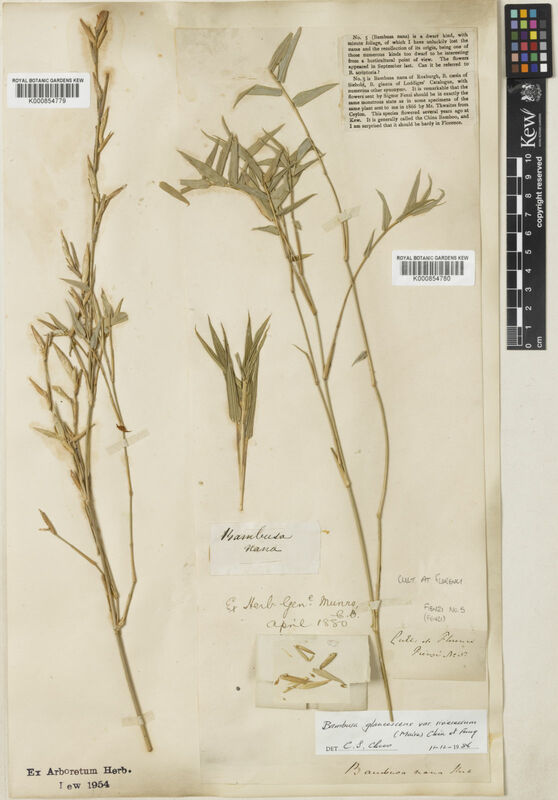 Flora of North America North of Mexico 24: 1-908. Oxford University Press, New York, Oxford. H?, P.-H. (2000). Câyc? Vi?tnam. An Illustrated flora of Vietnam, ed. 2, 3: 1-1020. Pham-hoang Ho, Montréal. Robertson, S.A. (1989). Flowering Plants of Seychelles: 1-327. Royal Botanic Gardens, Kew. Peekel, P.G. (1984). Flora of the Bismarck Archipelago for Naturalists: 1-638. Office of Forests, Division of Botany, Lae, Papua New Guinea. Gilliland, H.B. (1971). 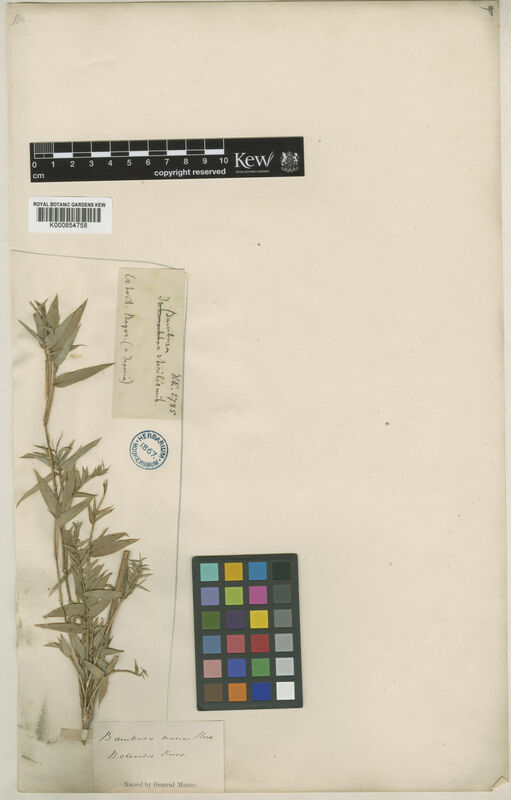 A revised flora of Malaya 3: 1-319. The Royal Botanic Gardens, Singapore.